List of Playtech casinos with honest review including reputability check of every Playtech online casino listed. Playtech was founded in 1999. They provide software for online casinos, poker rooms, bingo rooms, sports betting operators, scratch games and mobile gaming. Playtech was formed by Teddy Sagi, who in 2006 listed Playtech on the London Stock Exchange. Since then, the company has grown to be the one of the world’s largest traded online gaming software suppliers. In 2006, Playtech became a member of the Remote Gambling Association (RGA) and received the prestigious Certificate of Prior Approval from the Alderney Gaming Control Commission (AGCC). Playtech is often praised for its quality games, such as the very popular Marvel series themed slot games like Iron Man, The Fantastic Four, Elektra, The Incredible Hulk, X-Men, Blade, Daredevil, the Avengers and the rest. Playtech casinos software has a very good reputation, thanks to the security, game selection and performance, and that makes it so popular among the many online gambling sites which use their products and services. Playtech is also well known for its cross-platform management system, IMS, which is both fast and effective. In fact, you can play up to 5 games at once, should you wish to. The additional features include, for example, Multi-Player tables, Auto-Play, private tables with chat functions, Game History and a Play Money Module, which gives you the opportunity to test any casino game of your choosing . It is important to say that Playtech’s software is only available at online casinos which are located outside the USA. Unfortunately, the software company discontinued its service to US players as a result of the Unlawful Internet Gambling Enforcement Act (UIGEA) of 2006, which banned or limited online gambling in most States in America. Because of new legislation in Germany, Playtech-powered German online gambling operators have also decided to leave the market. One of the latest awards received Playtech was for ‘Most Effective Agency Collaboration’ at the International Corporate Event Awards in 2016. Just one year before, in 2015, Playtech also won the eGaming Software Supplier of the Year prize, at the publication’s inaugural Italy Awards, which were held in Rome. PlayTech's Random Number Generator (RNG) has been successfully tested to generally-accepted industry standards for highly-regulated jurisdictions by Gaming Laboratories International. The Certificate was issued on 8/20/2013 and is valid until 8/20/2018. The company has developed over 500 popular online casino games and continues to grow its selection of games by releasing about 50 new games per year. Formerly, each casino game was created in 2D, however, nowadays Playtech is also developing games in 3D. Playtech offers hundreds of video slot,s and one of its most popular categories is the abovementioned Marvel series. These are p roudly presented at Playtech’s casinos along with titles using MGM, NBC Universal and HBO content . That includes for example the 25-line and 5-reel The Sopranos, or the humorous Little Britain and Monty Python’s Spamalot!, which have also become player favorites over the years. Other than video slots, many Playtech powered online casinos also offer live-dealer games in HD streams amid regular RNG table and card games. That includes Unlimited Blackjack, Double Screen Roulette and the exclusive Casino Hold’em. For high rollers, they even have a VIP area called The Ruby Room. Users of Playtech software can access games via download, or by an instant play option within their browser. This offers flexibility and a wider general appeal for a variety of players that may be attracted to the gaming software. Within Playtech’s software, clients can find both a free mode and a real money option. Progressive slots and multi-player games can only be played in the real money mode. The fact that many users have made the switch from desktop to mobile has recently led the software company to start developing their games on HTML5 instead. This is due to the fact that any sort of games developed using this type of software can be played on any platform. So, whether you’d like to gamble on desktop, mobile or tablet, the choice is up to you - and the games will still work on any of these platforms. Playtech is well known for offering a wide range of progressive jackpot games, perhaps one of the largest selections in the industry. The jackpot games are very diverse and can include slots, video slots, video poker and certain table and card games. With more than 30 progressive jackpot games available, every player will have reason to feel satisfied. Among the most famous progressive jackpot games you’ll find the likes of Beach Life, Gold Rally, Jackpot Darts and Mega Ball. 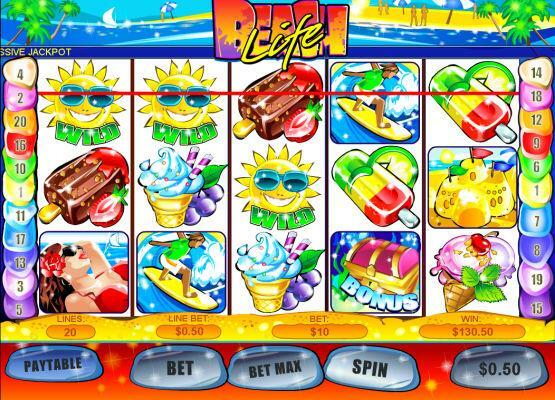 The biggest Playtech progressive jackpot was won on Beach Life in 2012 - a whopping €6,215,470. Use the filter on our website to find an updated list of actual bonuses offered by Playtech casinos. There you’ll find reload, cash back and free spin bonuses, as well as no deposit bonus offers. Playtech software is really popular in online casinos, and its games can be found in many of them. From the most popular ones, we can mention, for example, Paddy Power and Bet365. Before playing, be sure to check the review of your chosen casino on our website. Over the years, Playtech has managed to deliver a resonant casino experience by offering its casino software to multiple online casinos on the web. Playtech Casinos have all that a gambler could possibly desire. Alderney 27 Isle of Man 1 Malta 22 Gibraltar 20 Jersey 1 Kahnawake 3 Panama 0 Curaçao 25 Unknown 1 Belize 0 Costa Rica 1 United Kingdom 54 Austria 0 Canada 0 Antigua and Barbuda 0 Belgium 0 Bosnia and Herzegovina 0 British Virgin Islands 0 Bulgaria 2 Cambodia 1 Comoros 0 Cyprus 0 Czech Republic 1 Denmark 0 Estonia 1 Georgia 0 Ghana 0 Greece 0 Hungary 0 Ireland 0 Italy 8 Kenya 0 Latvia 0 Lithuania 0 Mexico 1 Netherlands Antiles 0 Nigeria 0 Paraguay 1 Peru 0 Philippines 10 Portugal 0 Romania 0 Serbia 0 Slovakia 0 Spain 7 Sweden 9 Aland Islands 0 Schleswig Holstein 0 British Columbia 0 Cagayan Economic Zone 7 Delaware 0 Nevada 0 New Jersey 0 Ontario 1 How we rate Licensing Jurisdictions?